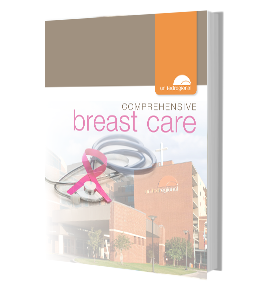 Click the here to download a detailed booklet containing information on our comprehensive breast care. 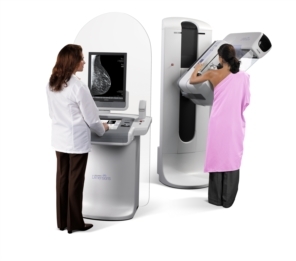 More and more women are getting mammograms to detect breast cancer in its earliest stages. As a result, breast cancer deaths are on the decline. Digital mammograms are still the best method to detect breast cancer early before it is big enough to feel or cause symptoms and when it is easier to treat. But it is only a two-dimensional picture of the breast. Since the breast is composed of pockets of dense tissue surrounded by fat, when x-rayed, it creates an image that looks something like a smoky haze. The overlapping tissue in the image makes it difficult to see tiny “spots,” called microcalcifications, and other subtle signs of early cancer. Women’s Imaging is located on the first floor of the Bridwell Tower and provides services from 8:30 am to 11:30 am and 1 pm to 4 pm, Monday through Friday. To schedule an appointment for a mammogram, please call (940) 764-5050, or complete the online form by clicking on the schedule button found at the bottom of the page. Pain, or fear of pain, is cited as one of the main reasons why 40% of women over the age of 40 do not get their annual screening mammograms. The Women’s Imaging Center in the new Bridwell Tower offers MammoPad® breast cushions, a soft, foam pad that helps minimize discomfort during a screening mammography. The cushion is placed on the imaging receptor, creating a warmer, softer surface between the breast and the mammography system. By offering women the latest technology in mammography, United Regional hopes to increase the number of area women who will be routinely screened. In 2016, United Regional performed over 6,000 mammograms. If the 3D mammography does reveal an abnormality, biopsies are the only definitive way to confirm if it is benign (non-cancerous) or not. Stereotactic breast biopsy is an alternative to open or surgical biopsy and is a safe and minimally invasive form of breast biopsy, which can more accurately pinpoint the mass. It is used to obtain tiny samples from an abnormal breast mass for examination by a pathologist. For most women, a mammogram is a routine matter, but for a woman whose exam reveals an abnormality, fear and anxiety can quickly set in. To help alleviate the apprehension of facing the next steps alone, United Regional has a certified breast health navigator to guide women through the process of additional testing and a possible diagnosis of breast cancer. She provides reassurance and education through every step of the care cycle, and educates women about what they can expect during treatment and ongoing care. 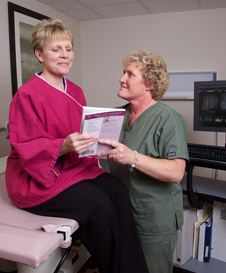 United Regional encourages all women to have mammograms on a regular basis based upon their age and risk factors. To schedule an appointment for a mammogram, please call (940) 764-5050, or complete the online form by clicking on the schedule button found below.